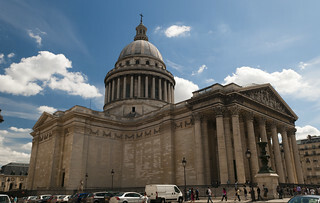 The Panthéon is a building in the Latin Quarter in Paris. It was originally built as a church dedicated to St. Genevieve and to house the reliquary châsse containing her relics but, after many changes, now functions as a secular mausoleum containing the remains of distinguished French citizens. It is an early example of neoclassicism, with a façade modeled on the Pantheon in Rome, surmounted by a dome that owes some of its character to Bramante's "Tempietto". Located in the 5th arrondissement on the Montagne Sainte-Geneviève, the Panthéon looks out over all of Paris. Designer Jacques-Germain Soufflot had the intention of combining the lightness and brightness of the gothic cathedral with classical principles, but its role as a mausoleum required the great gothic windows to be blocked. Nevertheless, it is one of the most important architectural achievements of its time and the first great neoclassical monument.